Photo: What is Allied Health? Allied Health is a term used to describe the broad range of health professionals who are not doctors, dentists or nurses. Allied health professionals aim to prevent, diagnose and treat a range of conditions and illnesses and often work within a multidisciplinary health team to provide the best patient outcomes. 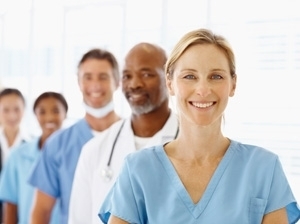 Allied Health professionals represent approximately 25% of the Australian health workforce. Over 154,000 Allied Health professionals registered with APHRA in 2013, an 18% increase from 2012, and the industry is continuing to experience significant growth. • Audiologist – Assessment, treatment and prevention of hearing and balance disorders. • Chiropractor – Diagnose and treat physiological and mechanical disorders of the musculoskeletal system. • Dietitian – Advises patients on nutrition for health, weight management or for specific medical conditions. • Exercise Physiologist – Focuses on therapy and rehabilitation of injury, chronic disease and disability through exercise. • Medical Imaging Professionals – Including radiographers, sonographers and radiologists. • Occupational Therapist – Assist people with illness or disability to develop or maintain daily living and work skills. • Osteopath – Works with manipulation of the musculoskeletal system to treat and prevent injury. • Orthotist – Prescribe, design and fit braces and other devices to aid mobility and rehabilitation, correct deformity and relieve discomfort. • Perfusionist – Operates a range of machinery during surgery (and in ICU) to monitor a patients physiological status. • Pharmacist – Prepare, dispense and manufacture medicines and advise on their appropriate use. Pharmacists may also work in a research capacity. • Physiotherapist – Focuses on the diagnosis, management and prevention of movement disorders and injury. • Psychologist – Studies, treats and evaluates mental and behavioural processes. • Social Worker – Helps people deal with personal and social issues through counselling, community engagement, advocacy and various programmes. • Speech Pathologist – Assess and treat patients who have a communication disability. Speech pathologists may also work with patients who have trouble swallowing. The diverse nature of this group of professionals means the training requirements vary greatly however most professions require tertiary study to practice in Australia. Some Allied Health professions are more specialised than others and can require extensive training including postgraduate study and ongoing CPD (continuing professional development). The HealthTimes website features a range of Allied Health courses which can be searched here.